I just got a couple of Flex TT5 Pocket Wizards for off camera flash, to replace the Plus IIIs. I wanted the flash and camera to talk to each other. 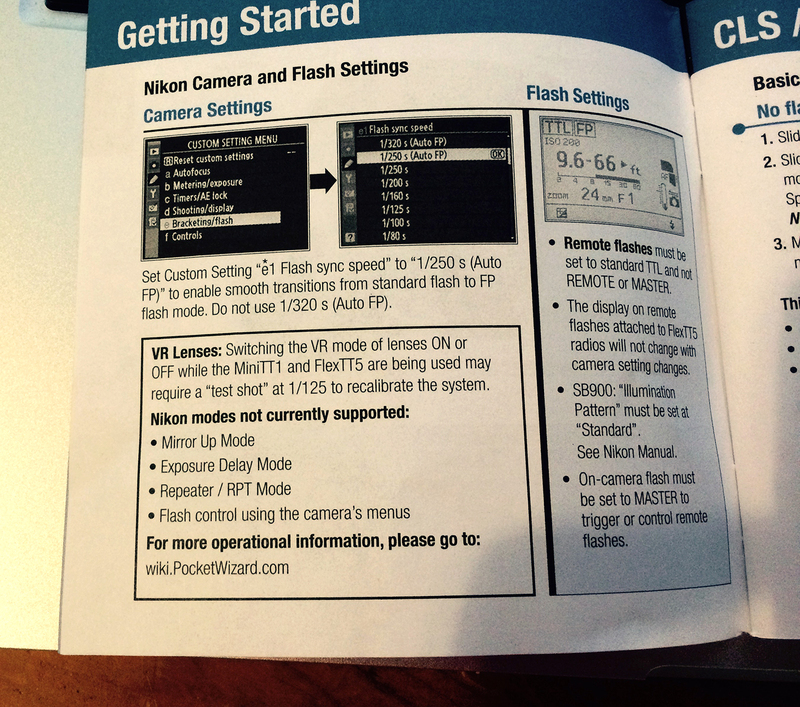 Here's my question: The book/pamphlet that came with the radios says under "Nikon modes not currently supported": Flash controls using camera's menus. So, sounds like I can't adjust the flash power via the camera. So, to use flash compensation plus up or minus down, do I have to walk over to the flash and adjust it? If so, fine. But this seems to negate the reason I got these instead of Plus IIIs -- to do everything from the camera so I wasn't walking back and forth all the time between my shooting position and the off camera flash. Have you tried it, adjusting flash power up/down? I cannot tell you, never used one, but surely that's got to be the most basic attribute you would want aside from having the flash actually off camera, because they are not cheap and you can do precisely the same thing with $20 triggers if you have to actually keep walking to/from the flash to adjust power levels. Neil has used them and obviously others, but have you actually tested personally, there may be some 'trick' you need to do in a certain order, as I know Neil has indicated in a post somewhere you need to turn on/off in a certain order, could be wrong. No, I haven't tried adjusting the flash power via the camera, since the book says this can't be done (if I'm reading that right). I agree, it's a basic reason why you'd get these rather than cheaper manual triggers. I guess the main reason being that the flash operates in TTL with these, as though it were on top of the camera's hotshoe, but still I adjust the power all the time when on top of hotshoe in TTL. Not sure about a sequence trick for this. But yes, both the book (I think) and a couple of You Tube vids I saw say you definitely need to turn the radio/flash/camera on in a certain sequence for the radios to work right. But I don't thin that was related to allowing you to use the camera to control flash power. I love my pocket wizards- you will need an AC3 to mount on top of the mini or flexes but each receiving flash also needs to be mounted on a tt5. If you are using nikon speed-lights- any nikon flash that can serve as a controller should work. Example, if i mount my sb800 on a tt5 and mount a 900 on my mini- if i set the 900 to master- I can control the output of the sb800 from the menu on the sb900. Its not that hard actually. The AC3 is maybe 70 bucks at best. Thank you Mach0. So, if the controls on your 900 atop the mini (which is on the camera?) can control the remote flash's output, would my 900 or 910 atop the TT5 on my camera control the flash output on my remote flash, equipped with another TT5? Of course, I don't want my flash atop TT5 and camera to fire so how do you disable that? "Nikon modes not currently supported": Flash controls using camera's menus. So, sounds like I can't adjust the flash power via the camera. With the D5 and D500 you can control the flash via a menu in the camera. They didn't say you can't adjust the flash via the camera. It's an important distinction. You can adjust the TTL flash power via the camera, using the flash exposure or overall exposure compensation. If you use the TT5 without a flash on top of it as a master, or without an AC3 controller, then you have wireless TTL flash. So you can use the TT5 like that, but you have just the one mode - TTL.